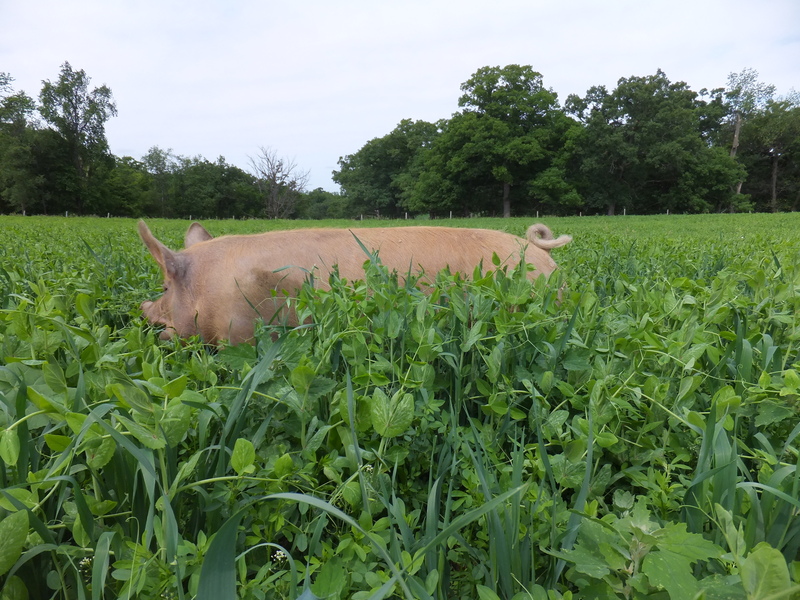 I planted two forages for a pig pasture this spring which are new to me. I’m very pleased with the forage peas. I’m not happy with the sorghum-sudangrass, but don’t feel I utilized it correctly. I no-till planted both into last year’s pig pasture on April 23rd. I used my single-disc John Deere grain drill, which is not considered a no-till drill, but works great when the ground is mallow in the spring. I planted about 25 lbs to the acre for each. Above you can see what most of the pasture looks like. Three-foot high forage peas growing thickly. 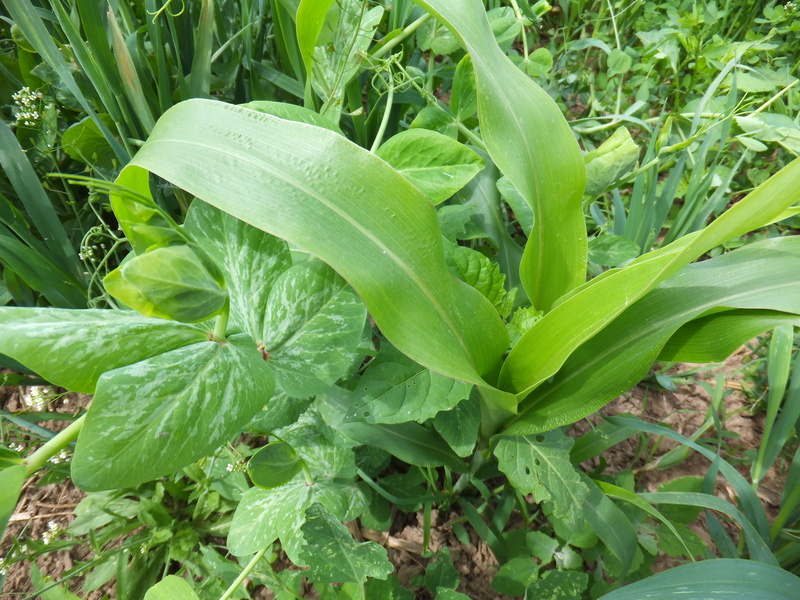 The warm-season sorghum-sudangrass has been overpowered by the cool-season peas. Below you can see an open area where each plant is growing side by side. The sorghum-sudangrass is thriving here. It looks like corn. The pea is the green and white leaf on the left. The sorghum-sudangrass is called Surpass BMR 6, and is from Lacrosse Seeds. I can’t even find the forage pea on their website. It’s safe to say the pea did better, but I believe it’s all in how I used them. Planting them together and early in the spring is an advantage for the peas, and the results bear witness. I shouldn’t have planted them together, but I wanted to try both plants and wasn’t sure I would have another spot to plant in this year. Waiting another year is just too much. I also think the sorghum-sudangrass would have like to have been planted deeper, but no-till into mallow ground worked great for the pea. On a side note, Buckwheat no-tills very well in the spring, although it is not supposed to tolerate frost. 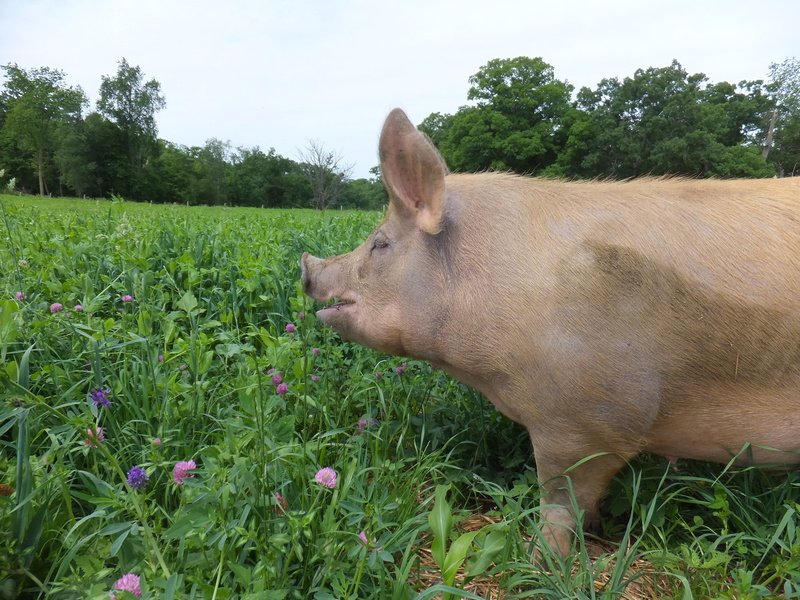 I couldn’t resist including the photo below with my model sow amongst the purple and red flowers of alfalfa and red clover. 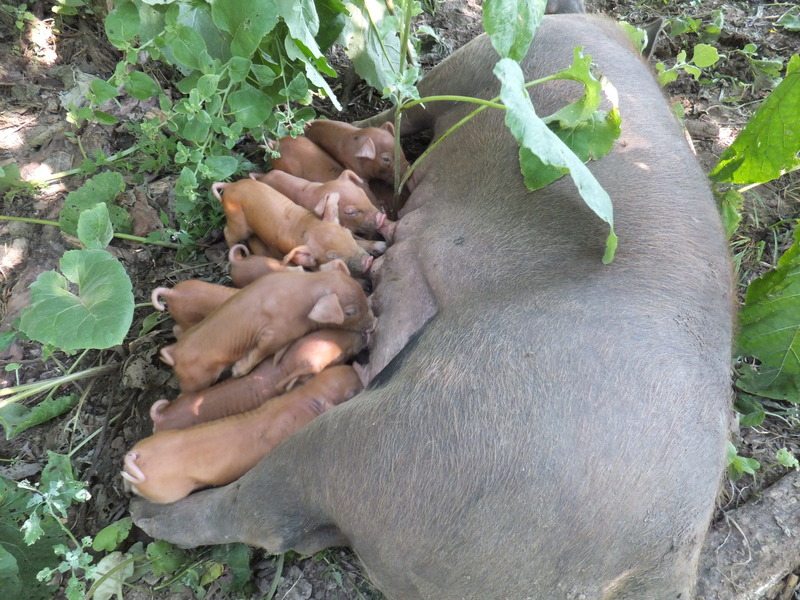 The sow was pictured last September as a gilt with her beautiful litter. She has large, erect ears, which make it seem as if everything is exciting to her. Maybe everything is. This entry was posted on Friday, June 20th, 2014 at 2:51 pm and is filed under Curious crops, Curious hogs. You can follow any responses to this entry through the RSS 2.0 feed. You can leave a response, or trackback from your own site.